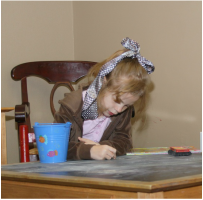 Belaire Counseling Services provides counseling for children through play therapy. "Youth cannot know how age thinks and feels. But old men are guilty if they forget what is was to be young." Dr. Belaire provides one-on-one counseling and play therapy for children ages 3 to 12 years. Play therapy is counseling for children that utilizes play, which is a child's natural expression of his/her world and provides a means for children to work through their emotions. When working with children, Dr. Belaire also works with parents to address the child's issues, implement parenting techniques, and to facilitate positive parent-child relationships. Counseling children is a unique form of counseling, and children need a safe space where they can explore their development, work through issues, and express their needs. Confidentiality is a crucial part of the counseling process. Children need to feel comfortable expressing themselves in a secure counseling relationship. Dr. Belaire works with children and parents to balance the child's need for confidentiality and the parents' participation in the counseling process. "A child's voice, however honest and true, is meaningless to those who've forgotten how to listen."